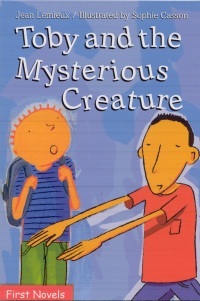 CM Magazine:Toby and the Mysterious Creature. (First Novels). Toby and the Mysterious Creature. (First Novels). Jean Lemieux. Illustrated by Sophie Casson. Translated by Sarah Cummins. 64 pp., pbk. & hc., $5.95 (pbk. ), $14.95 (hc.). ISBN 978-0-88780-759-6 (pbk. ), ISBN 978-0-88780-761-9 (hc.). The class was restless. Mrs. Dasgupta was about to say Now, children! the way she always does, but Merlin Higginbottom-Campari beat to it. Now, children! he said, imitating her tone of voice and accent perfectly. Everyone started laughing. We looked at Mrs. Dasgupta. She seemed to think it was pretty funny too. I don't know how he does it, but the walking atlas has got her wrapped around his little finger. Jean Lemiex's novel, translated by Sarah Cummins, tells the story of Toby, an eager eight-year-old, who wants to win a prize by giving the best oral presentation to his class in the last week of school. He is surprised to see that the creative presentation by the new kid, the weird kid, Merlin, is as mesmerizing as it is unusual. Lemieux introduces Merlin as a new student who has come to school near the end of the year. Many children will identify with being the new kid in a class. The author depicts Merlin as a new student, unaccepted by the rest of the class, who, unlike the other students, has no partner with whom to present. What the narrator, Toby, and the rest of the class discover, all through Merlin's short presentation about an imaginary animal, is that Merlin is bright, creative, funny, and interesting. In fact, he is just the kind of friend that Toby would like to have. 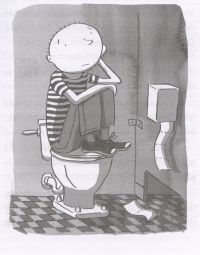 Sophie Casson's illustrations, at least one per chapter, add to the overall understanding of the text.